Live Stream this Friday, 20 May 2016! 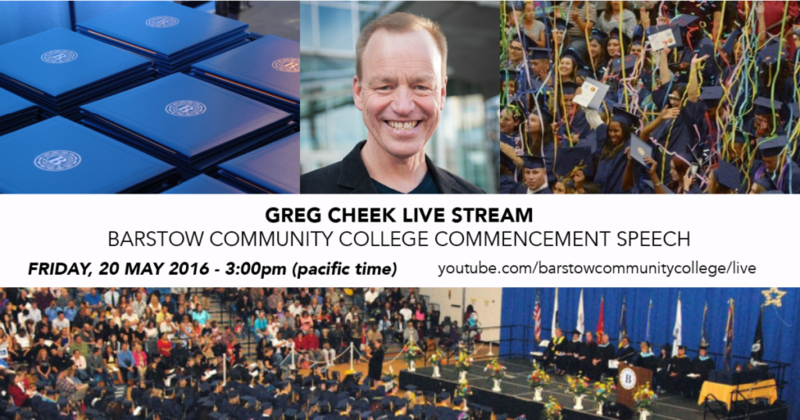 I’ve had the pleasure of teaching for Barstow College since 1997. I’ve been able to teach 2-3 classes every semester for BCC since 2004. I have over 2,700 students that have gone on to do amazing things around the world! I’ve had the pleasure of teaching at 7 different community colleges and also the Univ of Kansas, Univ of Nevada, Las Vegas, Univ of Maryland, Park College, and the Univ of Texas. Over 130 college courses taught while having the OPPORTUNITY ( I hate the word “work” in reference to a job) to serve in the military on active duty and as a DoD civilian and now run my speaking business. It all started with Barstow College and I love this college and the OPPORTUNITY it provides for everyone. It’s a long way from not graduating high school in Northern California. I tell every audience, “Life is not a SPRINT, it’s a beautiful MARATHON” Have a GREAT Day and enjoy the ride with ENTHUSIASM and OPPORTUNITY!